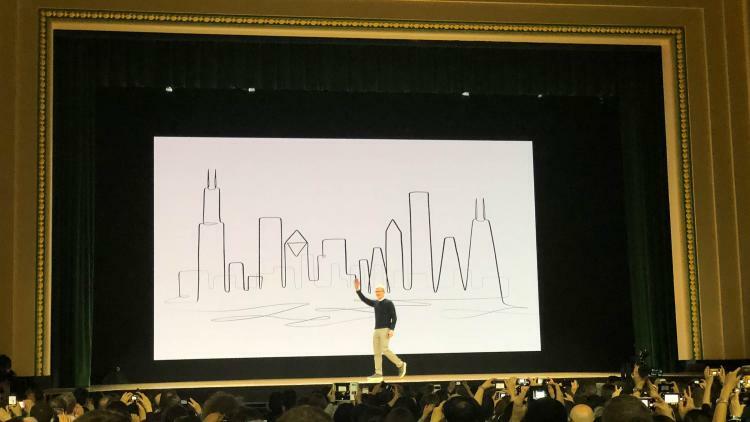 Today, Apple held their education-focused spring event to discuss new education products and ideas. The event was held at Lane Tech College Prep High School in Chicago, Illinois where attendees were given personalized schedules for the day. This marked one of the few Apple events to be held outside of Cupertino. “Imagination is the key because you’re using your knowledge, what you know, to make something no one’s made before,” was the monologue by students in the opening video which underscored Apple’s vision of technology in the classroom. iPad has always been a tool designed for creatives. Working with photos, videos, music and recently drawing (thanks to Apple Pencil) has been easier and more immersive compared to other devices. Apple continued to push this platform forward today by announcing a new 9.7-inch iPad with Apple Pencil support. New versions of Pages, Numbers and Keynote now support Apple Pencil and allow students to add drawings or teachers to annotate papers. Additionally, the built-in A10 Fusion processor enables the new iPad to run augmented reality apps — bringing a whole new dimension to learning. Students can truly unlock their creativity on iPad, and schools can purchase the new iPad for $299. While new hardware is great, Apple also announced some exciting tools and programs for students and educators to get the most out of iPad in the classroom. Here’s a brief rundown of what’s new and how Jamf can help make these programs work. Introduced two years ago at a similar spring event, this program allows schools to manage device deployments, deploy apps and integrate with Student Information Systems (SIS). When paired with a mobile device management (MDM) tool, schools can zero-touch deploy iPads and prepare them for shared use — known as Shared iPad. IT admins can use Apple School Manager to also create Apple IDs, which now come with 200GB of iCloud storage space. Learn more about Apple School Manager and how to connect it with Jamf for iPad management. The Classroom app is an assistant for teachers that grants control over students’ iPads. Teachers can observe a student’s screen, navigate them to a web page, or open and lock them to a specific app. This app has been available for the iPad, and is coming soon to the Mac. When it does, iPad classroom management can be conducted from a Mac, instead of solely from a teacher’s iPad. An MDM tool, like Jamf, allows IT to configure classes for teachers and deploy the Classroom app. Learn more about classroom management with Jamf. Part of today’s education update also included a new Schoolwork app and framework for teachers to create handouts, connect to education apps, and track student progress. Deep linking to education apps will be enabled by a new API kit, known as ClassKit. Education apps, like eSpark, will be able to use this new developer kit to integrate into the upcoming Schoolwork app. IT will set up Schoolwork within Apple School Manager, so teachers can take advantage of this powerful new app. Finally, Apple highlighted their renowned Apple Teacher program, which offers professional development and learning for teachers. Apple announced new curriculum programs, specifically designed for the iPad — Everyone Can Code and Everyone Can Create. The coding curriculum helps teach students how to create apps using Swift Playgrounds, a free app that makes coding fun. Coming this fall, there will be a new curriculum available to teachers that will help leverage the creativity enabled by the new iPad and Apple Pencil. Exciting updates from Apple! And know that when new operating system features are available, Jamf will offer compatibility with zero-day support. Want more Apple insight? Head over to Jamf Nation or read this device management for beginners guide.